At Maxim Security Alarm Service our systems and alarm services are designed to secure your business, and protect your employees. Maxim Security's wireless technology gives you offsite access to your alarm monitoring system, video monitoring and sends email and text alerts. Maxim Security Alarm Service is the area's premier source for home security. We install, service and monitor new or existing residential alarm and security systems. Our alarm services provide a comprehensive array of home security including wireless alarm installation and monitoring, fire alarm, medical monitoring, and video monitoring. 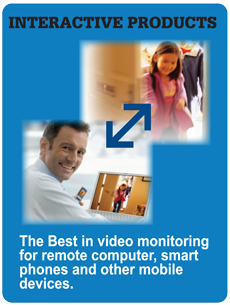 Digital video surveillance provides capabilities such as real-time video alarm verification and motion activation. Pay your bill or establish recurring payments using our online payment center.